At times it may be useful to slow down the speed of the game animation in order to negotiate a tricky section, or observe something more carefully. In King's Quest 1 EGA, speed is controlled by selecting a choice from the Speed menu, using the arrow keys. You can generally interact with the game by typing simple commands consisting of as little as a noun and a verb. For instance, the command lower the rope into the well can be shortened to lower rope. Unless otherwise instructed, follow all commands with ENTER. 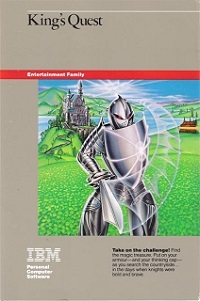 King's Quest 1 EGA will understand many common verbs, such as look, get, read, load, pry, climb, push, play, tell, use, ask, give, take and so on. You can repeat a command by pressing [F3].